The Moto G5 has been officially launched in India, after about 20 days since the G5 Plus was launched in the Country. And as reported earlier, the Moto G5 will be available exclusively, on Amazon India’s portal. The Moto G5 has a 5.0-inch 1080p Full HD display, which is slightly smaller than what its bigger brother features. You don’t see very many 5.0-inch Phones these days, so this should cater nicely to those preferring a compact form factor. The phone runs on Android 7.0 Nougat, and is powered by an octa-core 1.4GHz, Qualcomm snapdragon 430 processor. The Moto G5 comes with 3GB RAM and 16GB of internal storage,, and supports up to 128GB of expandable memory via a microSD card slot, which is a dedicated one. So you can use a microSD card and Dual SIM cards at the same time, just like the Moto G5 Plus allows you to. Photography wise, the Moto G5 adorns a single 13 megapixel rear camera. which supports PDAF, and has a Dual LED Flash, and an f/2.0 aperture. The front camera is a wide angle 5 megapixel lens. The Moto G5 packs a 2,800 mAh battery, which supports Turbo Charge. 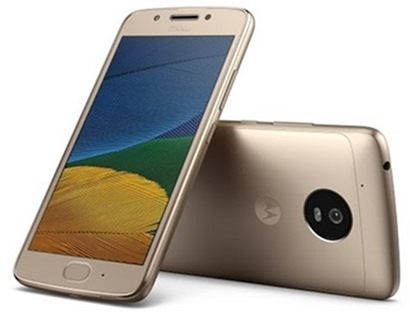 The design of the Moto G5 is quite similar to that of the Moto G5 Plus, with a full metal body, and a front facing fingerprint scanner, housed on the bezel just below the display. This scanner supports swipe gestures, which the Lenovo owned company calls, One Button Nav, The Moto G5 has been IP67 certified for dust and water resistance. The Moto G5 has been priced at Rs.11,999 for the 3GB RAM/16GB variant. The Moto G5 will be available in India, from midnight today (April 4th), from Amazon India. There are a few launch offers for the Moto G5. Amazon Prime members will get Rs 1,000 cashback, when they place the order using Amazon Pay balance.The cashback will be added to their Amazon Pay wallet. HDFC credit card users can get Rs 1,000 as cashback, along with a Free SanDisk Ultra microSD memory card. You can also exchange your old smartphone, for an extra Rs 500 off with HDFC cards.